Sold on a Monday was not what I expected. When we’re first introduced to reporter Ellis Read, he’s killing time taking photographs. A couple of boys playing in front of a run-down house catch his attention. It’s not until he’s snapping their photo that he sees the sign on the porch: 2 children for sale. Read’s editor wants to run the photo with a story, but the photo gets ruined. When Ellis returns to re-take it, the family is gone. In desperation, he takes the left-behind sign and stages a similar shoot with neighbor children (who are not for sale). 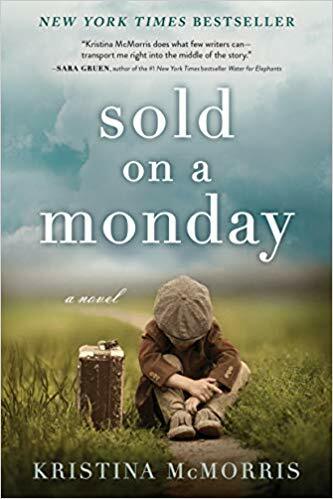 Sold on a Monday isn’t about either set of children. Rather, it’s about Ellis Read. How far will he go to make his career? More importantly, how far will he go to set things right when the far-reaching consequences of his actions are revealed? Forgiveness, of self as well as others, is a major theme of the story. As one character states, “Even decent, well-meaning people could make poor choices under pressure.” How then can we determine, both individually and as a society, when leniency should be extended and when it should not? At what point should society make a judgement of a someone (for example, that a couple are not fit to be parents and should not be allowed to adopt children)? Kristina McMorris obviously did her research for this historical novel. Elements of daily life in 1930s New York are sprinkled throughout, providing a firm setting. I could pick a few nits, but for the main part the book is well written. The characters are engaging and the chain of events is poignant. The pacing varies, as it should in any good story; however, it does drag in a couple of areas while racing too quickly in a couple of others. Overall, a good read worth the time. Four stars. “Before We Were Yours” by Lisa Wingate was a similar heart-wrenching novel that I read last summer. Thanks for the review. That one is still on my TBR list. Seems this was the year for stories of children separated from parents.